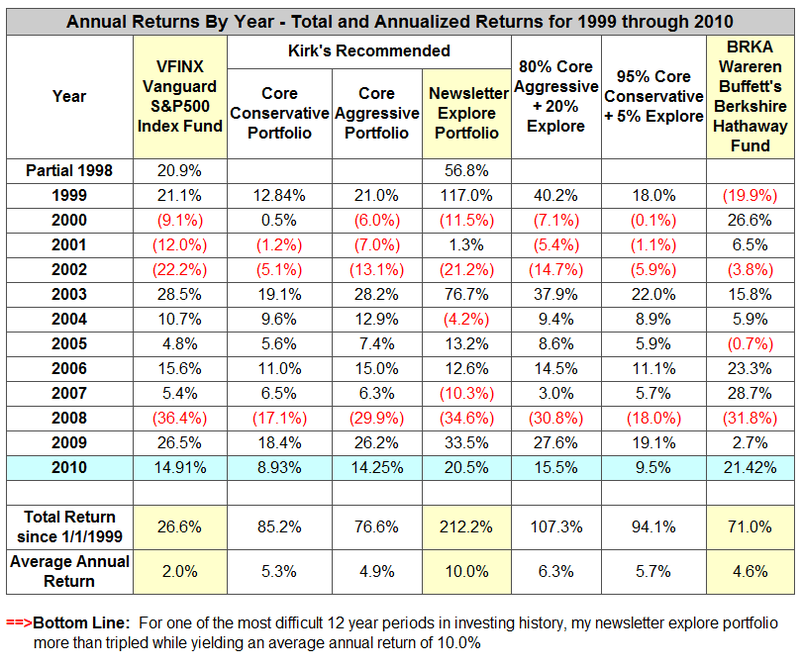 In 2010 my "Explore Portfolio" gained 20.5%!! 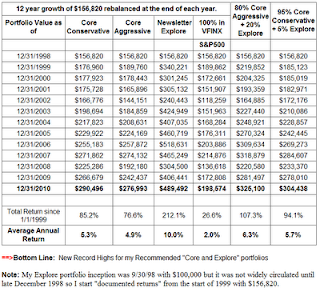 The explore portfolio was roughly 70% equities for the year so the stocks in the portfolio had a banner year! 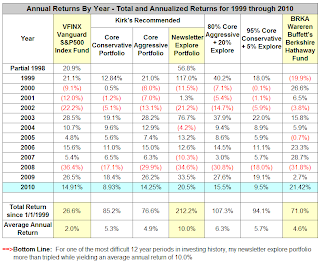 Click for a full performance table here. 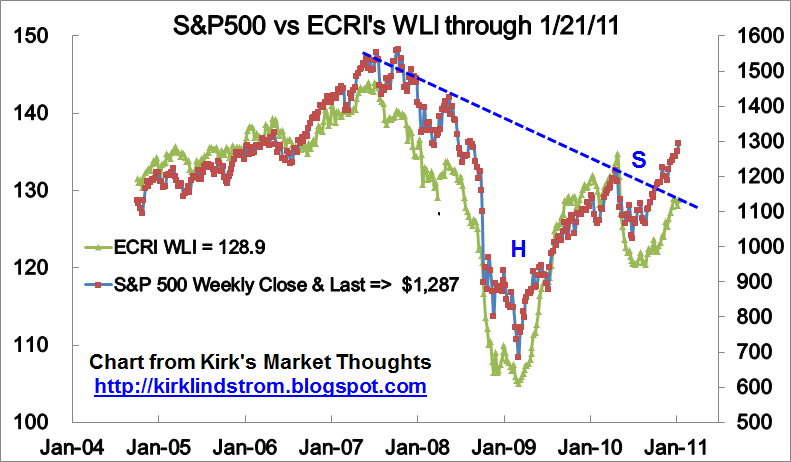 WLI is 128.9 up from the prior week's reading of 128.1 and equal to the reading for the week ending December 24, 2010. These are the highest readings since 36 weeks ago on May 7, 2010 when WLI was at 131.9. Since apparently bottoming at -10.3 for the week of August 27, WLI growth moved higher or was flat for the 21st consecutive week to plus 3.1% from plus 3.6% a week ago. 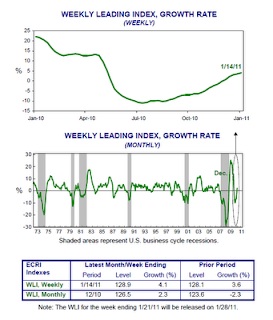 WLI growth of 4.1% is a 34-week high. 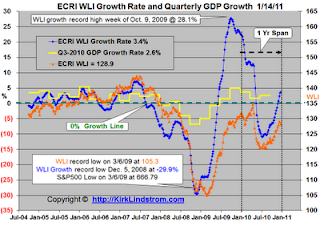 The last time WLI growth was higher was the reading for the week ending May 21, 2010 when it stood at positive 4.9%. On November 30, 2010 we reported in "ECRI Calls for Revival of US Economic Growth" that ECRI said "with a lot of conviction, that there is a revival in growth right ahead of us." 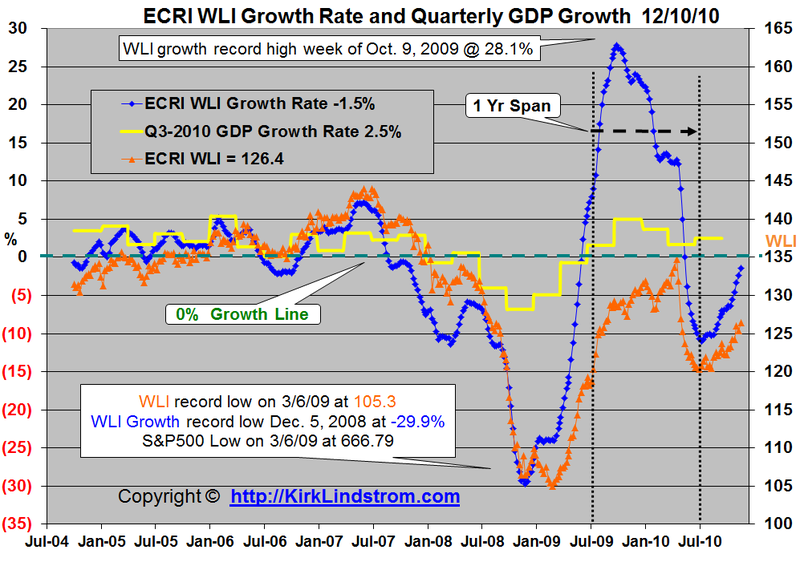 Since then, the economic data continues to slowly improve. Commenting on the January 14th release, ECRI's Co-Founder, Chief Operations Officer and author of "Beating the Business Cycle", Lakshman Achuthan said: " With WLI growth rising for ten straight weeks to a 33-week high, U.S. economic growth will soon begin to revive." 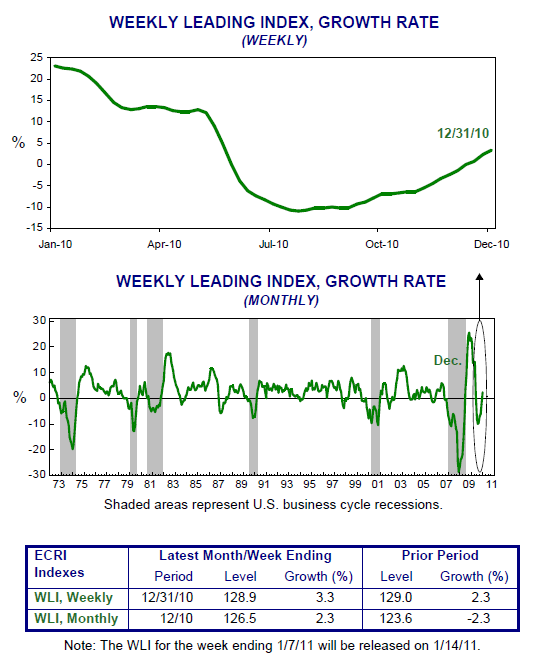 Since apparently bottoming at -10.3 for the week of August 27, WLI growth moved higher or was flat for the 20th consecutive week to plus 3.7% from plus 3.3% a week ago. 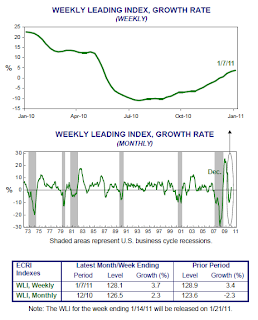 WLI growth of 3.7% is a 33-week high. 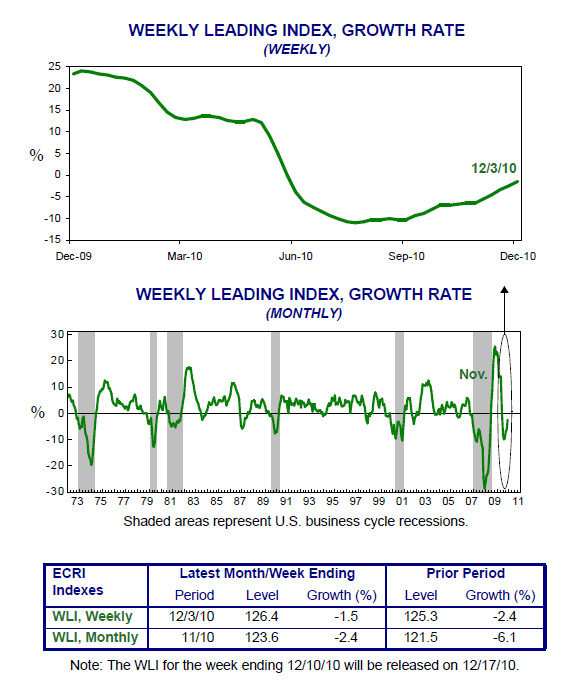 Commenting on this data release, ECRI's Co-Founder, Chief Operations Officer and author of "Beating the Business Cycle", Lakshman Achuthan said: " With WLI growth rising for ten straight weeks to a 33-week high, U.S. economic growth will soon begin to revive." Summary of Consuelo Mack's interview with Wall Street's long-time number one ranked economist, Ed Hyman of ISI Group, and BlackRock's star Global Asset Allocation Fund manager, Dennis Stattman. You can watch the full interview at the bottom of this summary. The economy is not very healthy because we are doing quantitative easing. About 3 months ago, it looked like the economy was going into a double dip. Since then, the economy is looking "much, much better." Chronic problems will be with us for a long time. We have too much debt. We are not producing enough in our economy compared to what we are consuming. Harder to get employment going due to higher costs of employment. But, compared to expectations of three or six months ago, the economy on the short-term is doing better. The big problems will be there for years. 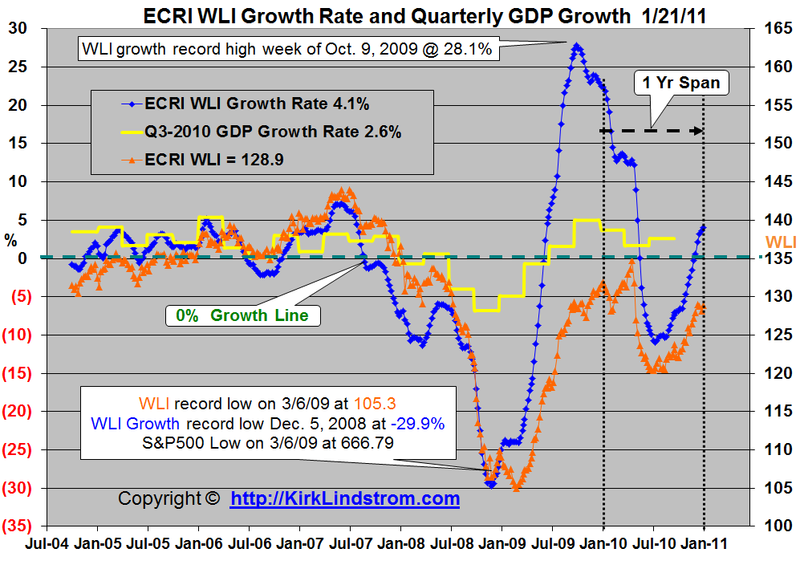 3% Real GDP in 2011. Fed Funds Rate of near zero percent for the full year. 6 quarters of 3% growth and unemployment last month was 9.8% so 3% is not enough to grow jobs. 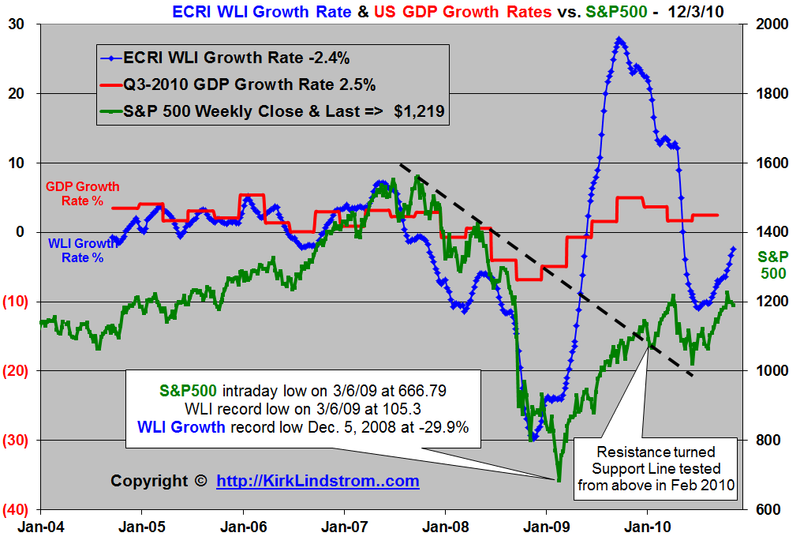 Thus believes the Fed and the president want 4% GDP growth to grow jobs. Like Clinton, he believes Obama is doing his version of a move to the center to grow jobs and get reelected in 2012. Dennis Stattman: Believes the monetary policy is near the level of "desperate." Spending has been very aggressive but little has been done to address the production side of the economy. Regulation and tax uncertainty is hurting small businesses. Politicians will have to move to address this or they won't get reelected. 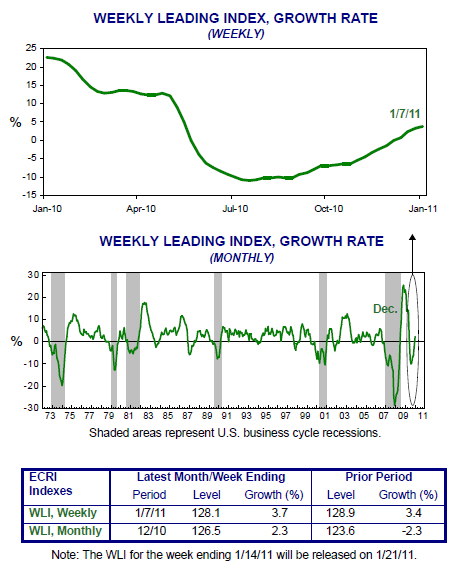 Ed Hyman: Believes focus will shift to 2012 with Q1-2011 GDP coming in at a "new high." Dennis Stattman: "Stocks in the US are quite reasonably priced." Many US stocks benefiting from higher growth rates outside the US but they are selling at low PE ratios due to US troubles. Blackrock's Global Allocation fund is at 36% of fund in US Equities, the highest exposure in a long time. Fixed income exposure is lowest ever and thinks bond market is dangerous to investors. Ed Hyman: Believes the US stock market "is going up." Adding to Dennis`s picture, Ed believes the Fed introduced QE2 to increase the value of stocks, to drive investors into riskier assets, to increase confidence with higher stock prices and thus lead to increased hiring. Ed agrees "completely" with Dennis on bonds and believes that the bond market (10-year yield) is heading towards 4.0%. To go above that would be "epic." Dennis Stattman: Has about a market weighting in the dollar or 60%. 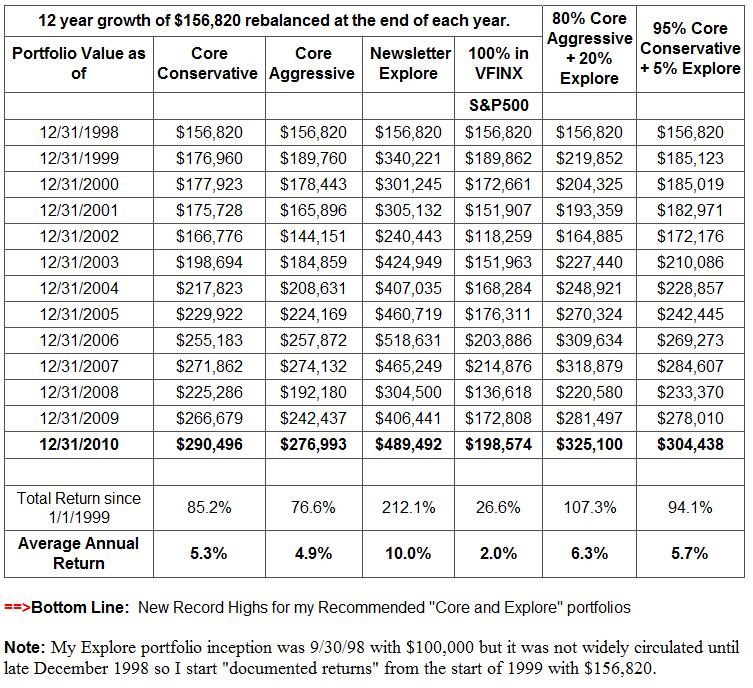 Most investments are in dollar but that also means 40% are in non-dollar investments. "I would be very nervous to be 100% US Dollar." Ed Hyman: "Being neutral sounds like a reasonable position. "Agrees with Dennis and believes the emerging currencies like the Yuan will go up. Not bullish or bearish on the dollar. 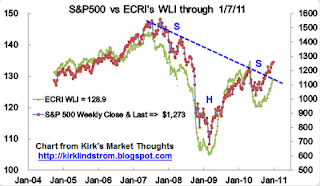 Dennis Stattman: Likes IBM (Charts & Quote). Get a very solid growth investment with a 1.7% yield. Thinks IBM has a good "blueprint" to get earnings per share to $20 by 2015. Ed Hyman: "I would put my money in Dennis's fund." The one stock that sticks out to him is Citigroup (C charts and Quote). He likes emerging economies and Citicorp or Citigroup has done a better job than the other banks in the emerging markets. He also believes Vikram Pandit is "an emerging markets person" and is a great leader. If Citi gets over $5, then the stock can be bought by more institutional investors. If I had to pick one stock, I'd pick that stock. 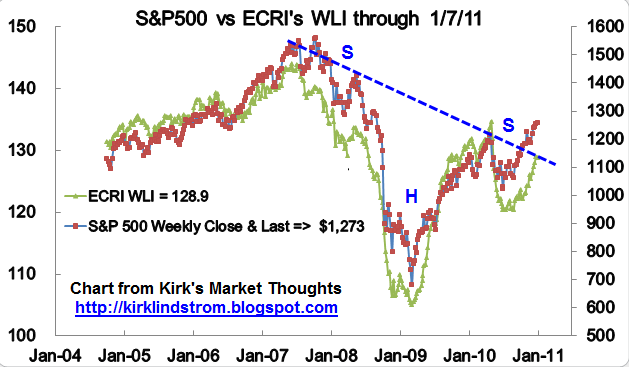 Disclosure: I own both IBM and C.
WLI is 128.9 down a tick from the prior week's reading of 129.0. The last time WLI was higher was the reading for the week of May 7, 2010 when it stood at 131.9. 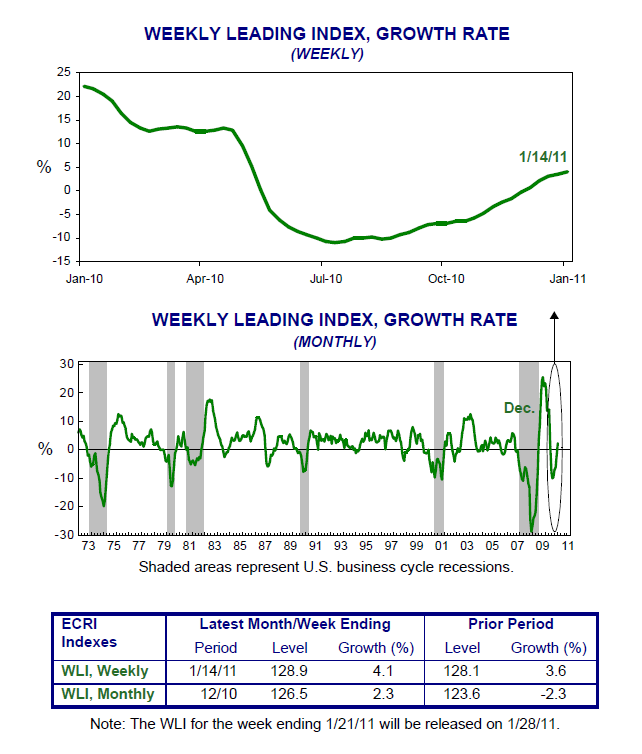 Since apparently bottoming at -10.3 for the week of August 27, WLI growth moved higher or was flat for the 19th consecutive week to plus 3.3% from plus 2.3% a week ago. 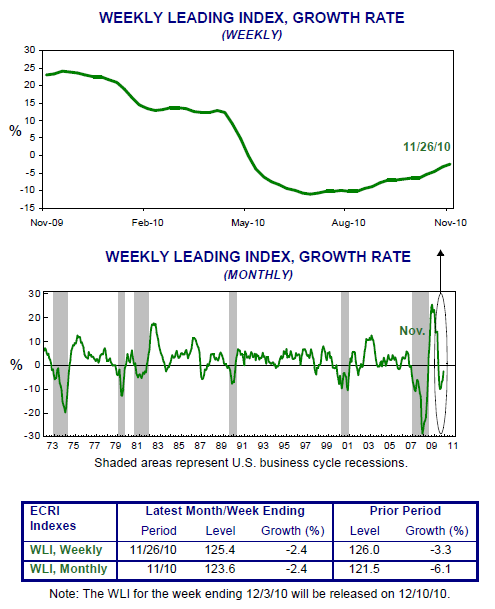 On November 30 we reported in "ECRI Calls for Revival of US Economic Growth" that ECRI said "with a lot of conviction, that there is a revival in growth right ahead of us." Since then, the economic data continues to slowly improve.